1Department of Agro-industrial Technology Brawijaya University, St Veteran 65145 Malang, East Java, INDONESIA. 2Graduate Student of Agricultural Technology, Brawijaya University St Veteran 65145 Malang, East Java, INDONESIA. 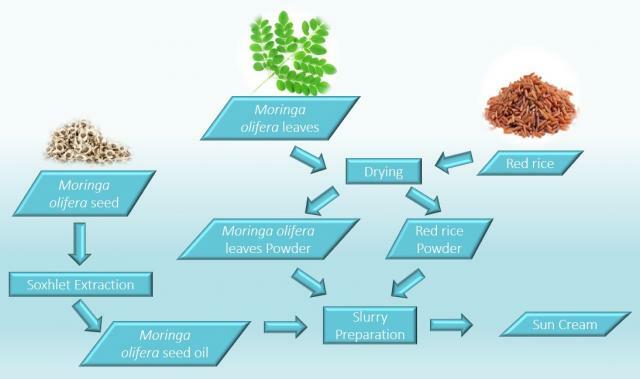 Moringa oleifera seed and leaf contained available medium fatty acid profile and essential amino acid bound in the tissue which should be hydrolysed. The addition of red rice which has antioxidant compound namely ZnO that can have protected the skin from sun burn and also to make the gelatinous slurry due to reducing the moisture content. The utilization of oil seed and leaf as raw material and fortified with red rice for making a low-cost sun cream is beneficial mainly for women living at rural region. Two phases of experiments were carried out. The first phase was the effect of time and temperature on the yield and oleic acid content of the oil. A randomized block design with two factors was carried out. The temperature at three level (50, 55, 60oC) as the first factor, and the time of extraction at three levels (12, 15, 20 hours) as the second factor. It was found that treatment of 50oC at 20 hours extraction shown the best result. The yield of oil was 34% and the oleic acid content was a 71.9% from the extracted oil. A randomized block design was used to carried out the second phase of study. The time of steaming (30, 45, 60 minutes) as the first factor and the red rice concentration (5%, 10%, 15%) as the second factor. The result shown that the use of 60 minutes and 5% red rice concentration was the best result. The slurry has the moisture content of 40.4% and the protein content was 40.5%. The storage stability of the sun cream stored under low temperature (30±1oC) was 6 months and the characteristic of the slurry having oleic acid, essential amino acid and the ZnO. Kumalaningsih S, Arwani M. Nutritious Pure Herbal Whitening Sun Cream Processed from Seed and Leaf of Moringa oleifera Fortified with Red Rice. Pharmacognosy Journal. 2018;10(1):77-80.